David's San Joaquin SD Baguettes. A Post Mortem! Submitted by greenbriel on February 20, 2015 – 10:44am. Started these guys at 7am on Wednesday, took them out of the oven a couple of hours ago. I’m fairly happy with the shaping, and although I didn’t get impressive grigne and no ears are present, I feel like the scoring was OK, I think other factors contributed to the low bloom. First time attempting an epi, made quite a mess of that, obviously need a lot more practice there! The cold bulk fermentation ended up being more like 36 hours rather than 24, but there was hardly any (if any) increase in volume. I think my main mistake with these loaves was not going with my gut as I did when making txfarmers baguettes and letting the dough rise at room temp until the dough increased in volume and was bubblier. Crumb not nearly as good looking as my last batch, but I think the factors above are the cause of that also. The taste is wonderful – delicate and complex. 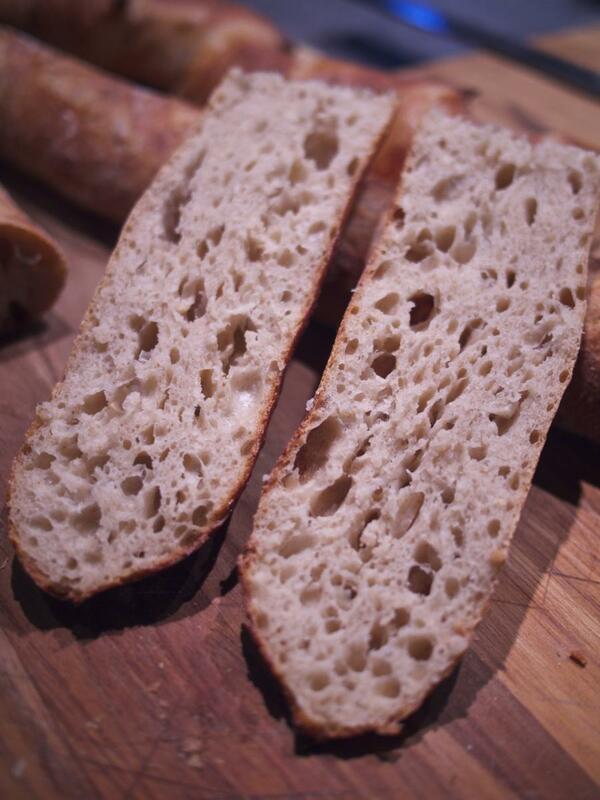 The crust is perfect – thin and very crunchy, and the crumb texture when eating is great, very soft and slightly chewy. I’m happy overall and will definitely try the recipe again and follow my instincts next time. Any other thoughts or insights welcomed!